A good night’s sleep can make a world of difference. And often when your sleep suffers, so does your health. If you’re waking up in pain, sick of tossing and turning or regularly feeling hot and bothered under your sheets, it’s about time you considered sleeping on the Trafalgar Gel Infused Memory Foam Mattress Topper. This soft and luxurious mattress topper boasts wide ranging benefits for your sleep and overall health, while offering long-lasting comfort and support for every body type. Sick of tossing and turning from being too hot? If you’re sleeping in hot conditions, you’re going to sweat. A lot. In fact, during summer you could be producing up to a cup of sweat every hour, right into your mattress. It’s no wonder overheating is one of the most common contributors to poor sleep. Sleeping at an optimal temperature is proven to promote a restful night’s sleep, and gel cooling technology can help you find your sweet spot (even when the weather heats up). Gel infused foam is ultra-breathable, allowing heat from your body to dissipate instead of making you hot and bothered. The Mattress Topper’s unique integrated gel balls are designed to reduce your temperature for a fresher, cooler and comfier sleep, no sweat! Memory foam is seriously clever. Originally developed by NASA, memory foam is now commonly used in everyday products because of its ability to mould in accordance with pressure, before returning to its original shape once the pressure is removed. 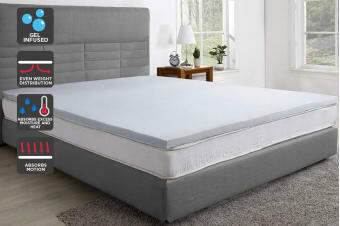 Your Memory Foam Mattress Topper will mould itself perfectly to your unique body shape, offering total body support and superior comfort all night long. No one likes starting their day rolling out of bed stiff and sore. 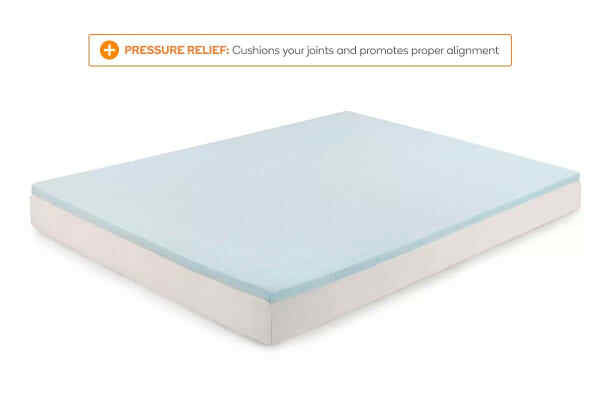 By taking pressure off bones, joints and muscles, the Trafalgar Gel Infused Memory Foam Mattress Topper can assist in relieving your body from aches, pains and tension. It gently cradles your body, taking pressure off your shoulders and hips to give your spine the best chance to align correctly while you sleep. Your mattress is an expensive investment. So why not protect it? 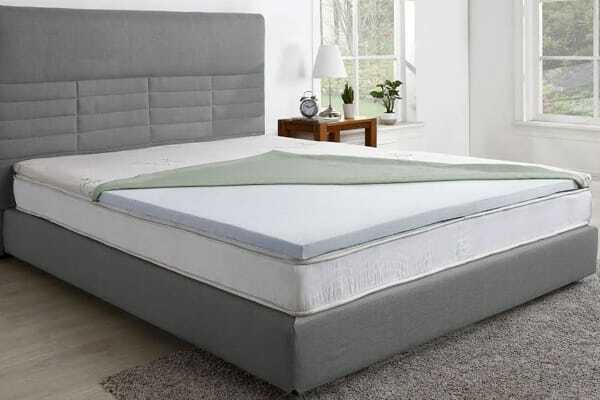 The Trafalgar Gel Infused Memory Foam Mattress Topper can act as a protective shield from leaks, spills, dirt and dust. Bamboo cotton is naturally resistant to dust mites and mould, keeping asthma and allergies at bay, while giving you a fresh, clean place to rest your head. Plus, bamboo is extremely light and breathable, and works to wick moisture away from your body, keeping you cool and comfy even on those sticky summer nights. Arrived very quickly from when I placed the order. its a great mattress topper! No drastic changes to sleep pattern, but too early to make any serious comment.